We ended up testing and comparing four cameras in four weeks. What's the difference between the VG-140, CyberShot, Lumix, and Exilim? Olympus, Sony, Casio, Panasonic were used, tested, and worked until we picked a winner. It’s not often that you get to own and test four different cameras in the short span of one month, but we ended up owning and extensively testing a Casio Exilim, Olympus VG-140, Sony Cyber Shot, and Panasonic – Lumix ZS8. Although we’re not camera experts, we gained a lot of good insights into the features and ease of use. Here’s how it happened and which one we liked the most. We’ve been using, and really liking, a Casio Exilim 14 Megapixel digital camera for almost two years. It was small, compact, had a great zoom feature, had an easy-to-use recording feature, and quickly downloaded pictures to our computer. The picture quality was excellent and it was quick to take pictures. Sometimes there’s a long delay between when you press the button and when the picture takes. This is normal and happens frequently in low light settings. The Casio focused quickly and had a short delay. It was tough camera and survived a number of drops. We did find its true nemesis. Sand. We took it to the beach. More than once. But who doesn’t take their camera to the beach now and again? When you live in San Diego, you end up at the beach a lot. Finally, after too much sand in the lens, the lens simply stopped opening. We liked the camera so much that we bought another exactly like it. After another year, the same thing happened. Despite liking the camera, we moved on to another brand in order to see if there was a better option out there. Our second camera was the Panasonic – Lumix ZS8. The Panasonic was not a great choice. We found the display to be difficult to use. The focus was smooth and the photo delay was short, but we had a lot of trouble getting into recording mode and ended up not recording a speech that our son gave at school. After a few days we became tired of this camera and were ready to return it when disaster struck. Somehow, the camera fell out of a backpack and onto the street in the parking lot where we subsequently ran it over. I’m sure it’s a tough camera, but it apparently it was not built to handle the weight of a Toyota Sienna. Also, just FYI, Costco will not take back a camera that you run over. Our third camera was a Olympus VG-140. We were a house divided on this one and ultimately, the head of the house was turned by the neck to a different camera. The display was easy to follow for this camera. It went very quickly to recording mode. The zoom was good, but it took too long to focus and take the pictures. With kids, you are less concerned about lighting and more just about capturing the moment. This camera just couldn’t seem to capture the moment. It would get the moment ten seconds after the moment. We bought this camera at Best Buy and had the one year protection and the easy return policy so we quickly returned it and picked up a different one. 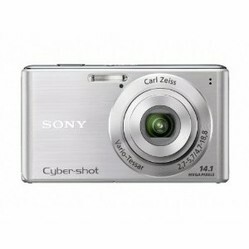 The last camera that we settled on was the Sony Cyber Shot. This is a quick point and shoot camera. It was great features and is easy to use. It captures “the moment” and takes clear pictures. I like it because it fits in my pocket but is still tough enough to take a little beating. It has the little features that are nice like identifying faces, landscape mode, panoramic mode, and recording mode. This has been a great choice and we are sticking with this one. In fact, we like this one more than the Olympus that we stuck with for so long. So that’s how it happened. Four cameras in a little less than a month. In general, the Sony Cyber Shot and the Casio Exilim were our favorites. I liked the Olympus but our family was not unified on that one, but we ended up with a better camera anyway. I’d stay away from the Panasonic. It just wasn’t intuitive. Happy hunting. Which digital point and shoot do you own?